The first thing to do is take two or three handfuls of your hamster's old litter into the hamster's new cage. Now fill up the food bowl and the water bowl. Besides from providing your hamster with new food and fresh water, everything should proceed this way for a week. Under no circumstances should you wake up your hamster or lift up its sleeping house! Gradually your little hamster will come out and explore its surroundings once again. Your hamster will start to mark its territory with its own scent by licking the sides of its body and rubbing it self on the cage. Now your little hamster should look like it has lived in your house for weeks. Once your hamster sleeps inside its little house in the afternoon and come out at night and does its night activities. It means that your hamster is completely relaxed in its new environment and it means that you can start to pick up your little hamster and he can now become hand tame! Your hamster may enjoy a dish of chinchilla sand that you can buy from the pet store. The sand is specially designed to help your hamsters coat. But don�t be worried or upset if your hamster doesn�t use the sand bath because each hamster differs from one another. Golden hamsters rarely use the sand bath. Yes your probably wondering�.Hamster potties? Well in general hamsters are very clean animals and will adopt a separate area of their cage as a toilet room. You can make the task of cleaning the cage even simpler by providing your hamster with a potty. You can make one yourself or buy one from the pet shop. Click here to read more. The basics of the hamster's diet should consist of a mix of grains, seeds and nuts. Although you can mix your own food, it would be advisable to rather buy a good quality hamster food mix. Please remember that if you buy hamster food and it has too many sun flower seeds this will make your hamster fat. Remember that your hamster only eats two teaspoons of food a day. It may seem a little but that is all that they can eat and most of it goes to hoarding. As a pet, the little hamster remembers all the little objects that were inside its cage and of course its scent. If all of a sudden there are different smells as before, the hamster acts uneasy and stressed. Therefore it doesn�t mean that you mustn�t clean out your hamster's cage. It just means that when you wash out his/her cage you must try not to use scented dishwashing liquid and you must try and put everything back as you found it in the hamster's cage. However carefully you look after your hamster, he may start getting sick and have injuries. Remember to always check your hamster regularly for any signs of illnesses - ideally when you take him out of his cage to hold him, just give him a quick inspection by checking his eyes - for any weeping, nose - a wet or runny nose, bottom - always check for wet tail! Check your hamster at least once a week. Also look out for overgrown teeth, and for over grown nails. But you only need to check that out at least once a month. All sorts of playing materials are now available. 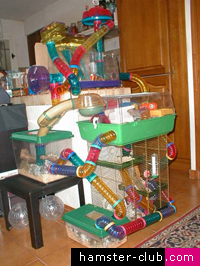 These include see-saws, and miniature houses with doors and windows that the hamster can climb in and out of. Remember that hamsters also love to climb and tunnel. So there�s a quick and cheap way out of this. All you have to do is take a toilet roll and put it in your hamsters cage. He will enjoy running out and in! I know it sounds silly but try it. Click here to read a hamster article about hamster homemade toys. Please beware that when you go and buy your hamster a wheel do not buy the hamster wheel with the gaps (a wheel with the gaps is like the one shown above) because the hamster can get his little foot in the gap and break it. Preferably buy a wheel with no gap. The Rex hamsters are one of the rare and unusual hamster breeds. Their hairs are lifted and slightly curled. This gives the coat a soft and plush appearance. The hamster's whiskers are also curled. Long haired Rexes coat is slightly long and it appears somewhat more scruffy. Rex hamsters differ from one another; some can have long soft push hair when some can have short tight hair. The first rex hamster appeared in 1970. � The eyesight of hamsters reaches only up to six inches in front of them. � Hamsters are color blind. � Hamsters remember their relatives. � A human year is 25 hamster years. � Hamsters can drink milk as long as it doesn't go sour. � Male hamsters are called Bucks and females Does. � Hamsters shouldn't swim and don't need baths.